Back in August last year, while playing Square-Enix Montreal's wonderful Lara Croft GO, I had a thought stemming from an in game costume. The "Augmentation" costume to me was an Easter Egg and possible teaser for a future Deus Ex GO game. A couple months later I tweeted to Square-Enix Montreal asking if we'd be getting a Deus Ex GO, and they favorited the tweet. It was not a confirmation by any means, but it was a little tease. Then, in March of this year, three domains were registered, Life is Strange GO, Just Cause GO, and of course, Deus Ex GO. This morning Square-Enix announced a "Deus Ex Universe Pre-E3 Showcase." 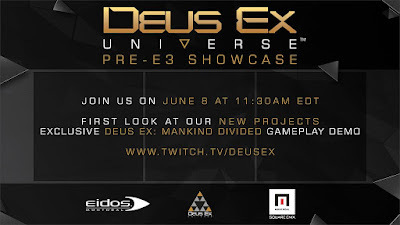 The show will air on June 8th at 11:30 Eastern, 8:30 Pacific time on the Deus Ex Twitch channel. Personally, I'm also hoping for a Thief or Murdered: Soul Suspect to be adapted into Go games. Both would provide some intriguing mechanics and potential that could be used. Perhaps Life is Strange GO will have a time-warping process included in the turn-based system to keep in line with the main game, possibly working a bit like the dimensional warping in Ghosts of Memories, which would work tremendously as a supernatural element for a Mudered: Soul Suspect GO. But as is, the three titles sound pretty good. Although, I wonder if Just Cause GO would be a small 3rd person mobile game, because that would be fun as hell and possibly bring some competition to games like Aralon or Marvel Future Fight. Beginning with Hitman Go, Square-Enix Montreal followed up with Lara Croft Go and its DLC The Shard of Life, and have kept up a wonderfully elegant and distilled form of gameplay. And I would genuinely like to see what they can do for these other properties in the Go style. Death Road to Canada: Arrives July 22nd! Transformers: The Last Knight: Barricade! Gravity Rush 2: E3 2016 Trailer! Sony E3 2016: NEW Open World God of War!